Over at Freshly Made Sketches they have a challenge going on. Sketch #11, hostess is Linda C. Check out all the fun! This afternoon it has been dark and rainy, although it is a nice day to stamp. The stamp sets that I used are from Papertrey, friendship jar and background basic text style. Designer paper is My Mind's Eye and Pretty Please. I hand cut out the jar topper and paper pieced the tag. Did some decorative stitching and on the marina mist cardstock I brushed the edges to make the paper darker, with the same ink. Then I finished the card by adding a button and some twine. Thanks Linda for a great sketch! A fun, home-y card...pretty colors and a wonderful sentiment for us all to live by! Thanks for joining Freshly Made Sketches today! What a great take on the sketch - I love how you flipped it around. The colors are fabulous and I love the detail you added with the stitching. Thanks for playing along with Freshly Made Sketches this week! Love the homespun look of your card! Your stitching is wonderful! Such a pretty card! So glad you joined us at Freshly Made Sketches! What an adorable card! I love the paper piecing and the blanket stitching. Great job! Thanks for playing with Freshly Made Sketches! This is wonderful! I love the double bow on the button and that lovely paper! Glad you joined us at Freshly Made Sketches! Paper pieced top is perfect on this adorably sweet card! 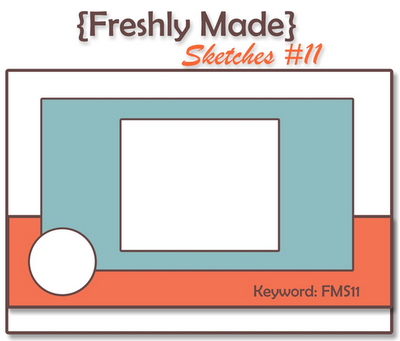 Thanks for joining us at Freshly Made Sketches!